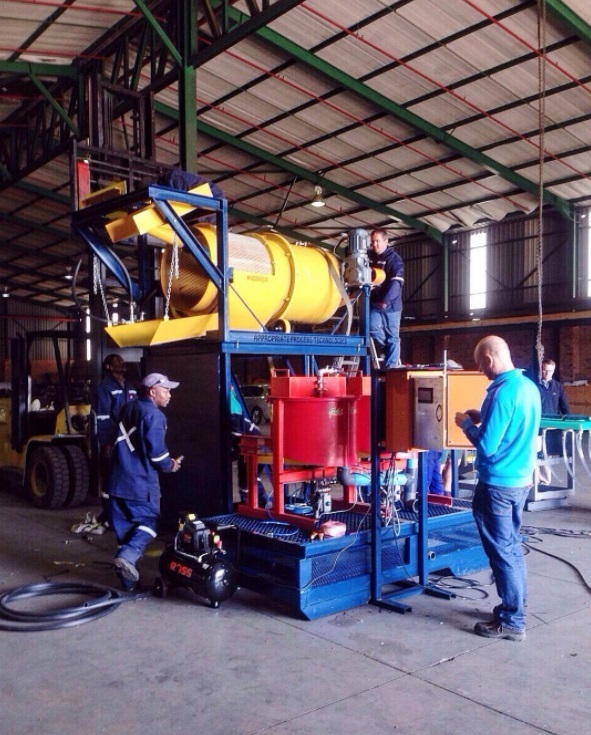 Mining Equipment Suppliers South Africa: plants headed out lately! As mining equipment suppliers in South Africa, not everyone around the globe gets to really see what we are all about, so we endeavor to show you as much as we can and this week, we're showing you the latest plants that have headed out. As always, our plants are manufactured, pre-assembled, pre-pluged and pre-wired all in-house, before being disassembled and packaged for their journey to site. This process allows us to have as much control as possible, ensuring our equipment is manufactured fast and efficiently. First up, the team working on an RG30 with Goldilox alluvial processing plant. The Goldilox system provides full automation of the GoldKacha gravity concentrator as well as protection of the concentrates, allowing for secure and continuous operation. Manufacture on this RG30 has been completed. Next to assemble the complete alluvial plant before delivery to Indonesia. Delayed by Irma, one of these guys is finally on its way to site via a very long path travelling from South Africa, to England, to Miami and finally the Dominican Republic. The latest RG30T, ready to be collected by the customer and destined for an exploration exercise in a neighboring country. This plant was completed in record time of three and a half weeks. You can read more about this fully comprehensive mobile gold processing plant here. Packed and ready to go. An RDGK15 gravity concentration plant destined for East Africa. We often document the plants as they arrive on site and installation and commissioning begins! If you would like to see these videos, scroll through our video section here and you'll be up to date on all things mining. If you have any further questions, don't hesitate to email us on info@aptprocessing.com or contact us here, we're always happy to help.